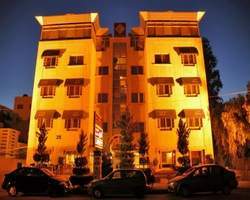 Capri Hotel Suites is located in the beautiful Sunny City of Amman in Om Uthayna. Capri is at the heart of the most dynamic activities going on in the city. Business Centers, major hospitals and commercial centers are just within reach from our hotel. On entering your suite the recent refurbishment now offers the comforts and high standards we feel our guests deserve. · Self controlled air conditioning and heating systems. · International direct telephone lines. · Wide choice of satellite channels. · Safe deposit box controlled by you magnetic card. · Iron and Ironing board. · Work desk in all suites. · Smoke and fire detectors in all areas. Capri Hotel & Suites Cuisine offers and interesting choice of food and beverages. Served by our courteous, helpful, friendly staff in an atmosphere of elegance and charm. A delicious breakfast buffet is served every morning. Lunch and Dinner meals are served A la Carte. Relax in the delightful garden-like surroundings with a selection from our appetizing menu anytime of the day. Capri Hotel Suites in Amman has all the facilities that you would expect from a hotel of our size and quality. The lift gives easy access to all our floors. And our housekeeping staff are keen to look after your every need. · Breakfast, lunch and dinner at Milano Restaurant. · Tea time relaxation at Florence Café. · Laundry and dry cleaning service. · High speed internet center. · Daily Newspaper and Touristic Brochures. · 24 Hours Room Service. · Wake up calls service. · Rent a car service. touristic trips to any region in Jordan. · Pickups and Drop-offs to Airports and Bridges.